An army major, his wife and a college lecturer have escaped jail after being found guilty of cheating to win the top prize in the TV quiz show Who Wants To Be A Millionaire? 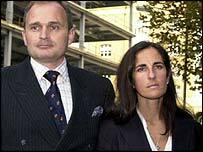 Contestant Charles Ingram, his wife Diana, both 39, and college lecturer Tecwen Whittock were all found guilty of conspiring to cheat the show. The Ingrams were sentenced to 18 months in jail suspended for two years while Whittock received a 12-month sentence, also suspended for two years. Ingram, who reached the £1m prize, was guided to correct answers with the help of deliberately timed coughs from Whittock. Ingram's wife was found guilty of helping "set up" the scam. The Ingrams were also each fined £15,000 and ordered to pay £10,000 costs while Whittock was fined £10,000 with £7,500 costs. All three had denied "procuring the execution of a valuable security by deception" - £1m on 10 September 2001. Judge Geoffrey Rivlin QC said the trio had been "shamed in the most public way" and their reputations ruined. He referred to the men's "shabby schoolboy trick." The verdicts came after the judge told the eight women and three men of the jury he would accept majority decisions after three days of deliberations. They were decided by a majority of 10 votes to one, the jury having lost a member for undisclosed reasons earlier in the trial. When the jury revealed its verdict, Ingram slightly shook his head while his wife reached for his hand. 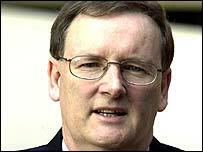 Whittock made no response when he was found guilty. The judge described the trial at Southwark Crown Court as a "most unusual case". He said there was "so little to mitigate" their criminality custodial sentences were inevitable but they should be suspended as the Ingrams had children. The judge told Mrs Ingram: "You might be well advised to thank your lucky stars you are not going to prison today, and put aside any childish wishes of bravado that you are entitled to this money." The prosecution had contended Whittock, 53, from Cardiff, a "fastest finger first" contestant, had used coughs to guide Ingram to most of the right answers. The court heard another contestant and members of the television crew were suspicious by Whittock's coughing outbreak. Sonia Woodley QC, Ingram's barrister, said the Royal Engineers officer was a "committed soldier" who had lived a "honest and decent, hard working life". Whittock's counsel, David Aubrey QC, said the Crown ignored coughs which did not coincide with correct answers, while disregarding other occasions when he had not coughed. A doctor told the court Whittock suffered from a year-round dust allergy, hayfever and tested "very positive" for asthma, which would have been made worse by a hot TV studio. After sentencing, quiz show host Chris Tarrant issued a statement saying the plot to cheat the show was a "very cynical plan, motivated by sheer greed". "I feel very sad about this whole business but I cannot really feel any sympathy for the perpetrators," he said. "It is hugely insulting to the hundreds and hundreds of other contestants who have come on the show, just hoping for much smaller amounts of money but prepared to try and win their money honestly." Police officers who led the investigation after the programme-makers raised suspicions said they were satisfied with the outcome. Detective Inspector Chris White, of the Special Enquiry Team, said this was a serious offence and the show was simply the vehicle to illegally obtain £1m. As Whittock left the court past the waiting media he faced a barrage of coughs and shouts of "cheat". He was later followed by the Ingrams, who walked out holding hands but also made no comment. Ingram's Millionaire appearance was never shown on television. Footage from the show will be screened for the first time in a Tonight With Trevor McDonald special on ITV1 later this month. The 90-minute documentary, presented by Tonight reporter Martin Bashir, will show the previously unseen episode in full as part of a "definitive" account of the scandal. "A shabby schoolboy trick to cheat the system"